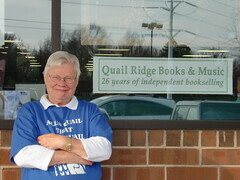 For Triangle area readers, Raleigh’s Quail Ridge Books is an institution. For the many fans of the store, it was sad surprise to see the News & Observer‘s cover story today, announcing that the store’s owner, Nancy Olson, is retiring and looking for a buyer. According to the article, Olson isn’t interested in just cashing out and retiring. She wants to find a suitable, new owner to keep the store in operation, for the sake of her employees and the community. Living on the West side of the Triangle, I rarely get to visit this gem of a bookstore. Nonetheless, I sincerely hope the store finds a new owner that will preserve the reputation and good will Quail Ridge has built up over the years. As noted in a previous post, the store has an amazing record of success and longevity, in business almost 30 years in the same nondescript location since 1984. Kudos to Nancy Olson and her staff, and let’s all hope the story will continue. This entry was posted in Around the Triangle, Books & Reading and tagged books, bookstores, postaweek2012, Raleigh, triangle area. Bookmark the permalink.